An international research project aiming to update an ancient, sustainable building material has succeeded in bringing it into line with modern thermal standards. CobBauge – an amalgamation of the English and French words for the material – is a collaboration between researchers in the UK and northern France, led by the University of Plymouth's Professor Steve Goodhew. Investigators on the project, the first phase of which runs until early 2019, have come up with a way to radically increase cob's ability to help trap heat inside buildings. The technique involves two different grades of cob – one lightweight version with greater insulating properties, and one denser, stronger type – that are bonded together to form walls. The results were shared with the public and construction industry professionals for the first time, at an event to mark the end of the first phase of the project hosted at the University. 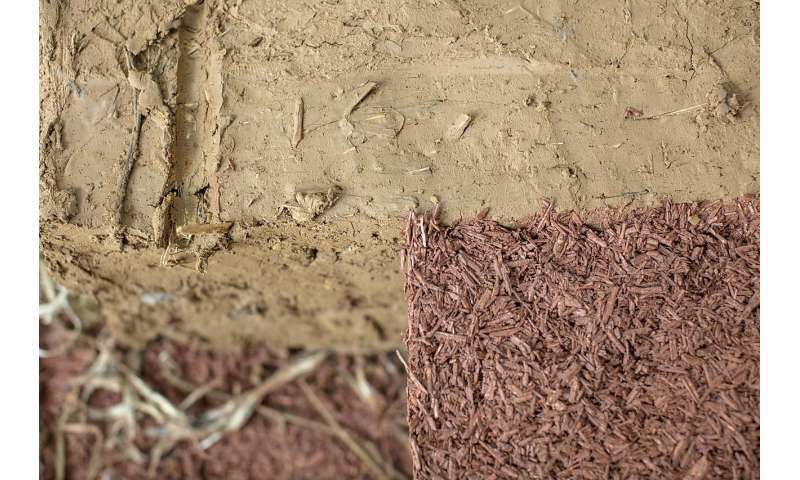 The use of cob – a mixture of earth, water and fibres like straw and hemp – has the potential to bring substantial reductions in carbon dioxide (CO2) emissions and construction waste compared to conventional masonry materials, as it is made with soil sourced from site. But traditional cob, which has been used for houses and other buildings across the south west of England and northern France for centuries, does not comply with the most up-to-date thermal building regulations. Researchers in the University's Building Research Group have spent the last year trying to find a solution, working alongside the Ecole Superieure d'Ingenieur des Travaux de la Construction de Caen (ESITC), Syndicat Mixte du Parc naturel régional des Marais du Cotentin et du Bessin (PnrMCB), Earth Building UK and Ireland (EBUKI) and the Université Caen-Normandie (UCn). The first phase of CobBauge was granted more than €1,000,000 from the Interreg VA France (Channel) England Programme and the European Regional Development Fund (ERDF). Professor Goodhew said, "What we're doing is taking a robust vernacular material and bringing it right up-to-date. A large part of the University's role in the project has been analysing and measuring the thermal performance of different types of soil and fibres, using the latest methods to optimise this ancient material. While what we have come up with is without a doubt a modern interpretation of cob, we hope it will satisfy both the traditionalists, and those looking for a hi-tech, energy-efficient material. As a result of this research, we can say there is no reason why cob cannot be used to build modern houses that meet the latest standards." "Anywhere you find heavy clay soils – like the south west of England – you'll find cob buildings, and some famously picturesque Devon villages, places like Broadhempston and Inner Hope, are almost entirely cob. Over the past year we've experimented with different mixes based on English and French soil, and come up with one each of the structural type, and one each of the lightweight thermal kind. The two together can be combined in a composite cob wall that will pass current regulations. Another aspect of the work will be in the next phase, a detailed analysis of the conditions inside cob buildings. Here we'll be studying real CobBauge buildings, subject to real environmental conditions over a prolonged period to investigate in-situ thermal performance, humidity, particulates, the presence of volatile organic compounds (VOCs) and related energy use. There is a realisation that modern building materials might have all sorts of negative consequences for inhabitants, making this work particularly timely, and creating a new focus on the use of natural materials like cob." While the focus to date has been on using natural fibres in the cob mix, work is ongoing to investigate recycled by-product material, such as end-of-life paper fibres. The aim is to determine whether other fibres could be used to deliver a viable CobBauge mix. The next stage of CobBauge, subject to further EU funding, will see at least two houses built using the new techniques, one on either side of the Channel. Researchers also aim to publish building guidelines for the new cob mixes, and train hundreds of builders in their use.